Promising all the traditional fun and flavour of the world’s largest beer festival, OKTOBERFEST-UK will add a Bavarian feast of entertainment to Bristol’s autumn calendar from 5pm – 2am on Friday, October 4th. 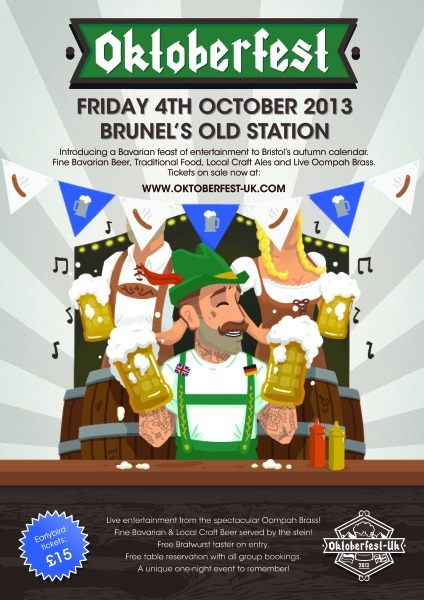 The iconic Brunel’s Old Station at Temple Meads will be transformed into an extravaganza celebrating all things Bavarian, serving up traditional food and drink fuelled by the UK’s Number 1 Oompah band performing live. Steins of Bavarian craft beers and lagers will be available alongside a selection of the tastiest local beers and cider as well as a wide range of traditional schnapps for those who dare. The party will kick-off with a bang to the stomping sound of an Oompah band and everyone will be encouraged to party, sing and dance into the early hours. It is expected to be a sell out event so it is advised to buy your tickets early. 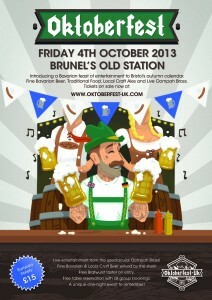 Tickets cost £15 per head, and can be bought from www.Oktoberfest-uk.com. Group tickets of 8 receive a free table reservation.